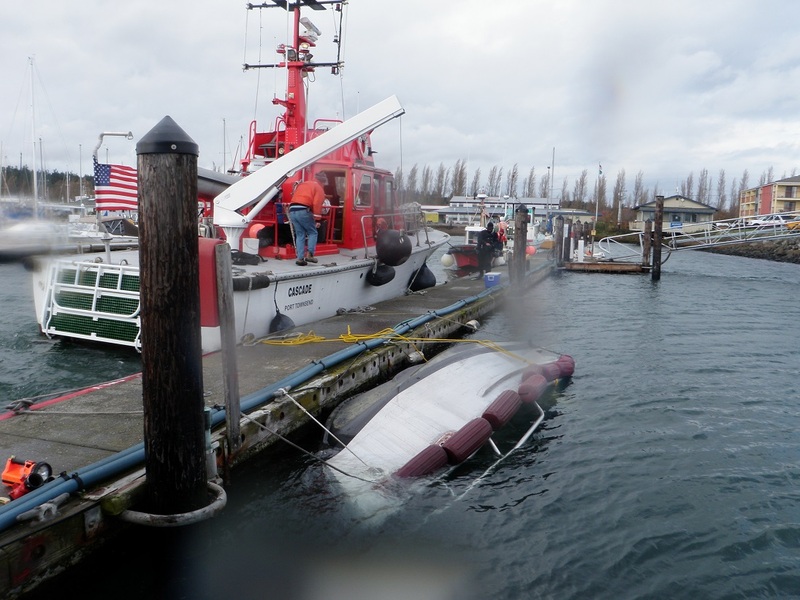 The East Jefferson Fire Rescue vessel, Volunteer, is battered every time it responds to emergencies in treacherous weather. It’s last mission likely caused a small crack in the hull which led to its sinking at the dock overnight. The nine-inch-long-crack was found about seven feet from the bow on the port side, and runs abeam the keel. There was no visible way to for the crew to detect the crack when they docked the boat for the night; but it was in fact taking on water in the hidden area between the self-bailing deck and the hull. Once the area between the deck and the hull filled with enough water it sunk to a level where water could then enter the scuppers, which normally would allow water to escape from the vessel, but at that level it simply allowed the water to flood in and likely it sunk quickly; while the outboard and cabin rolled to the point where the dock lines prevented it from sinking completely to the depths. We arrived on CASCADE (fitted with a crane). 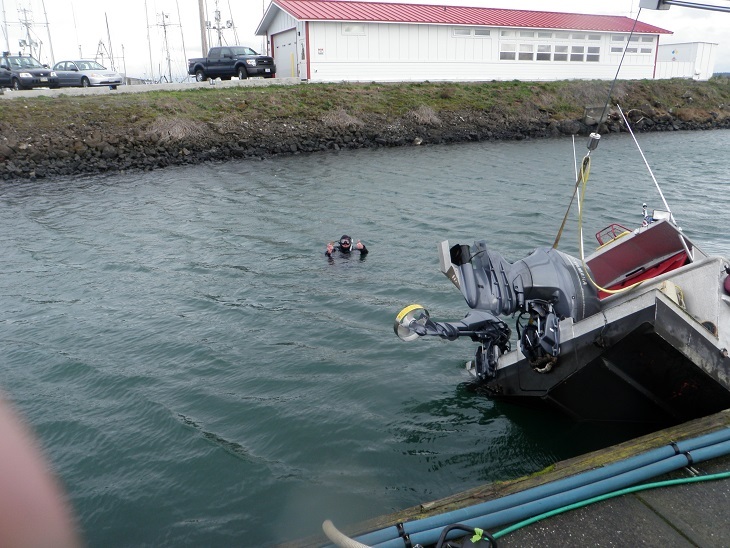 The diver placed lifting straps to each side of the stern on the cleats. The crane righted it and raised the stern. 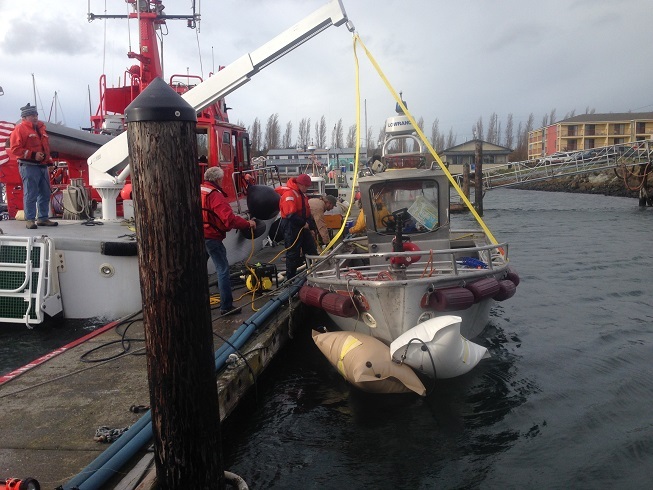 The two lift bags were placed and inflated to raise the bow. Once it was raised to the gunnel it was dewatered. 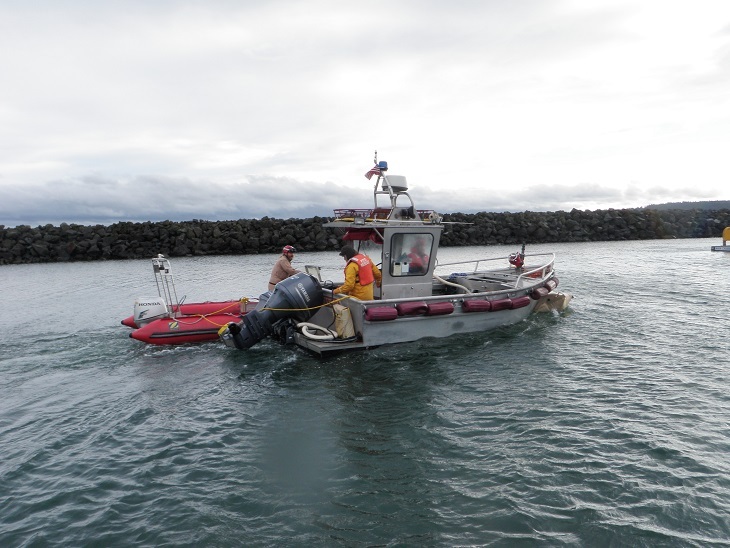 Pumps were kept aboard and Vessel Assist used their small vessel, Red Duck, to move it to the haul out. Once Volunteer was secured on the trailer I noticed the water seeping from the inconspicuous crack. If it had been fitted with a bilge pump in that area, the pump action would have indicated water was coming in and alerted its crew to the problem before it took on the water that sunk it; perhaps then Volunteer wouldn’t have met this maritime tragedy. 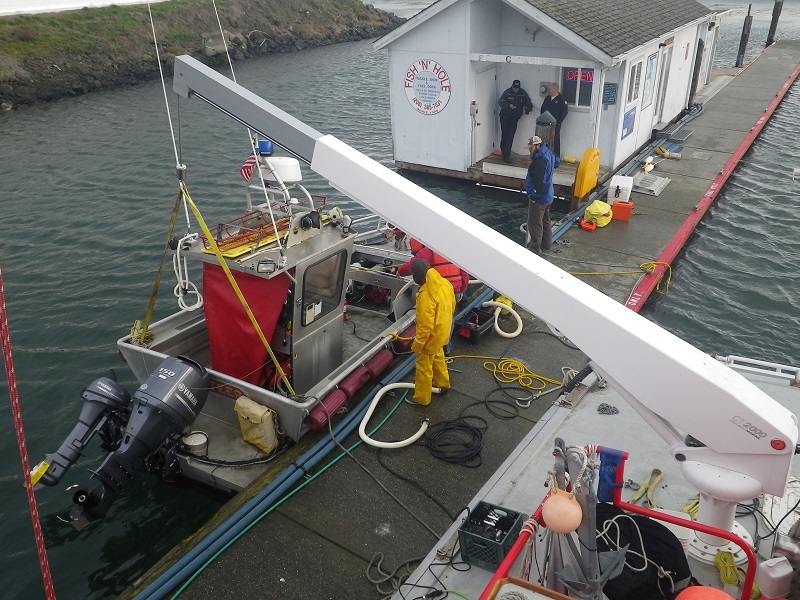 The R/V Cascade safely made its port’o’call in Port Townsend on 9/20/2013 after a 5 month excursion in SE Alaska. Welcom Back, Capt. Jack! This week we have been rotating out mission specific equipment in preparation for our anticipated winter workload. We are pleased to have successfully removed the styrofoam encased concrete dock from one of the most picturesque beaches of the U.S.; it was a somber reminder of the great loss of life that resulted from the tsunami in Japan. in the process we saved pieces of the dock that will be returned to Japan, though a small gesture we hope to show respect to a nation mourning. The dock was a master of construction. we marveled at its sturdy engineering, yet we cursed it as it resisted dismantling to the last piece. 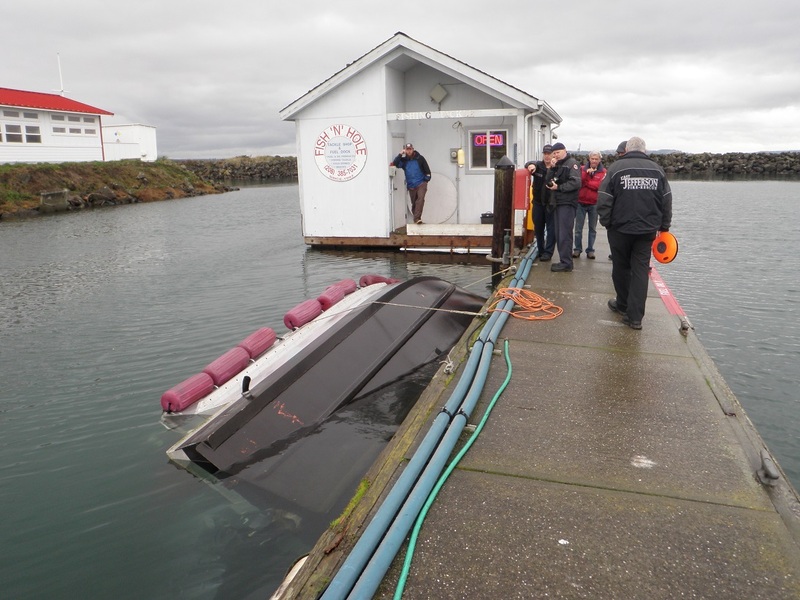 Tsunami dock removed from Washington coast | Local News | The Seattle Times. We will be posting many pictures and videos of this operation, as well as a write-up. Thanks to John Gussman for shooting this short, and highlighting some of the crewmen at work. Tsunami dock removal from Washington coast from John Gussman on Vimeo.